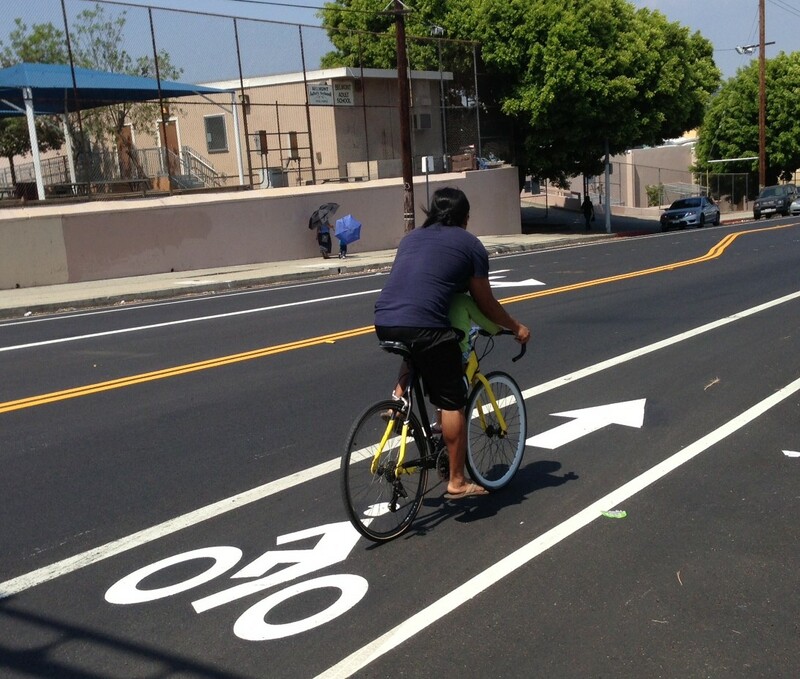 Recent census data shows that commuting by bicycle has increased in the city of Los Angeles. Photo: Joe Linton/Streetsblog L.A.
Last week, Streetsblog L.A. ran a national Streetsblog Network story DC and New Orleans Closing the Bike Commute Gap with Portland which summarized this BikePortland story. Those stories examined recently released Census data to shows trends in bicycle commuting. Since 2008, about 6 percent of Portland commuters traveled primarily by bike. The Census shows that bike commuting in Portland and Minneapolis (two places with reputations as being among the most bike-friendly larger cities in the U.S.) has mostly leveled off, while Washington D.C. and New Orleans are seeing increased percentages. What about Los Angeles? What does the latest Census data tell us about travel patterns here? Luckily, friend of the blog and L.A. City Bicycle Advisory Committee chair, Jeff Jacobberger downloaded and crunched the numbers. As Jacobberger clarifies below, these are Census data for work commute trips only. They can be useful for tracking changes over time, but they tend to mush complexities, to under-count low-income communities, and to underestimate overall actual percentages for walking and bicycling (by not including trips to school, the store, the gym, etc.). For example, if I bike a mile, then lock up and take a train for two miles, then disembark and walk a quarter mile to get to work, that would show up only as one train trip. The US Census Bureau has just released data from the 2013 American Community Survey regarding bicycle commuting in [the city of] Los Angeles for 2013: 1.8% of men usually bike to work, but only 0.6% of women, for an overall 1.2% bike commute rate. The wide disparity in male vs. female bike commuting is a clear sign that L.A.’s streets are not perceived to be safe places to ride. That is a 33% increase since 2010; and a 100% increase since 2000. Looking at that 1.8 percent number, Jacobberger mentioned some interesting comparisons to me when we talked at the Mid City West Park(ing) Day park. The number of U.S. men who identify as gay is 1.8 percent. The percentage of Americans who are Jewish is about 1.9 percent. Jacoberger arrives at this estimate by taking the midpoint of estimates of the “core” Jewish population from Wikipedia (6.1 million) divided by the US population per the Census Bureau (318.9 million.) Few media voices would get away with making a bald statement like “all gays are arrogant” or “all Jews are reckless,” but, sadly, we still see these sorts of stereotypes applied to all bicyclists, including in last week’s media coverage of the new 3-foot passing law. It is no surprise that the highest levels of cycling are the area around USC (which is comparable to Santa Monica) and parts of South L.A. Some interesting things pop out: e.g., West L.A./Westwood has an overall bike mode share equal to Silver Lake, Echo Park, Westlake. As you know, these numbers come with the big caveat that they measure only work trips (and don’t count kids riding to school, parks, etc.) My sense is that there are a lot of young non-work riders in places like Silver Lake and NELA, and not so many in West L.A. If you look at the California statewide data, the highest levels of cycling are around major universities (UC Davis, Stanford, Berkeley, Chico). When you look at the numbers near USC, it might be fair to ask whether better bike infrastructure around UCLA (and USC) might get bike commute shares closer to the levels seen at Cal. Thank you to Jeff Jacobberger for doing all the real work on this story! Streetsblog will look to dive deeper into the data and perhaps graph and explore trends over time. Metro reported a 42% increase in bicycle boarding’s at rail stations from 2012 to 2013. That buttresses the likelihood that the 20% increase in bicycle commuting from the ACS survey results did occur. From a study of the bicycle commuting mode share in 17 large cities by bike lanes per square mile of land done by Jennifer Dill and another study by miles of bike lanes/paths per 100,000 residents and commuting mode share by John Pucher, the average bicycle commuting share increase would be about 4 tenths of 1% for the amount of paths/bike lanes installed in the last three years. Odds are that its likely there would be another increase of about 2 tenths of 1% coming from the next two results. Compared to the 2007 ACS results, commuting to work by van, truck or car in the city of Los Angeles increased by 22,000 more people. Commuting by bicycle increased by 11,000 people in that same time period. The number of people commuting using transit is less in the 2013 results compared to 2007. The share of commuters who use a bicycle as their primary means of transportation to work has doubled from the 2007 results to the 2013 results. While it’s good to know that cycling is increasing (even with very little investment) this represents a doubling of L.A. bicycling’s modal share since 2000, is anyone else disheartened that we cyclists are still below “other”? That 2/3rds of commuters still drive alone shows the magnitude of what we’re up against. Very little of 42% bike-on-transit increase would be likely to show here at all. Unless the bike trip was more miles than the transit trip, it would count only as transit. Its a doubling of the bicycle commuting mode share since 2007. The mode share for commuting by bicycle held very steady from 1990 through 2007 at 0.6%. There is a margin of error of about 17% in the results, so its hard to pinpoint a trend with only a one year result. Putting in 151 miles of bike lanes in only two fiscal years gives support that this increase did occur.Averages from the 90 largest cities indicates that its likely that another increase of.2% will happen from the 200 miles of bike lanes and paths installed in the last three fiscal years. It takes some time before people change their main mode of transportation to work after bike lanes are installed. It took two years after LA starting aggressively installing bike lanes before a mode share gain was made and four years for New York City under Janette Sadik-Khan’s leadership as the commissioner of the NYDOT. The difference in time could be due to LA putting in the 200 miles of bike lanes/paths in a shorter amount of time than NYC did for their 200 miles of bike lane installations.. Interesting analysis. Seems like bicycling is most popular in the wealthy enclaves of Los Angeles. These are the “squeaky wheel” neighborhoods that get all the attention from the city. The rest of L.A. might as well not exist.